TALLAHASSEE, Fla. – The 2019 Florida Senior Games, presented by Humana, Series Qualifier events, sanctioned by the Florida Sports Foundation, are in full swing throughout the Sunshine State, giving opportunities for athletes aged 50 and above to Bring Your Game to competitions in the state of Florida. The 21 local series qualifiers give senior athletes the opportunity to compete in a variety of events throughout the state, many of which are qualifying events for the annual Florida Senior Games, presented by Humana. 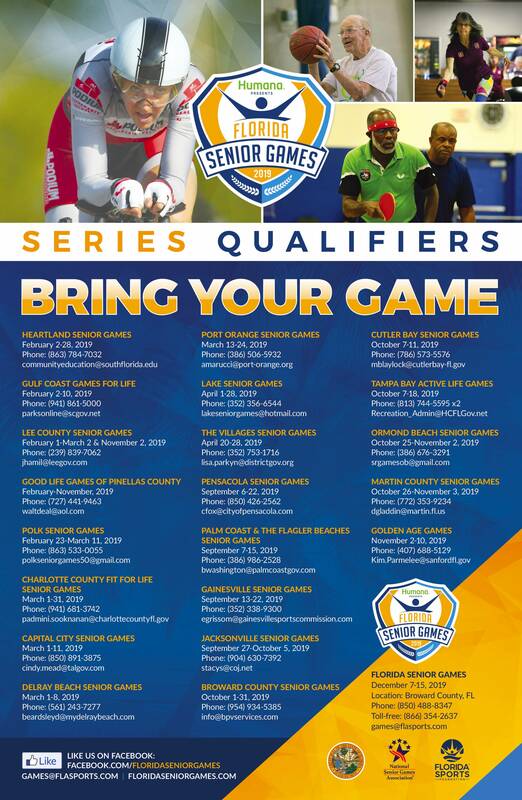 A qualifying performance at a Florida Senior Games, presented by Humana, Series Qualifier is necessary for state of Florida athletes wishing to compete in Basketball Shooting, Bowling, Cycling, Golf, Horseshoes, Pickleball, Shuffleboard, Swimming, Table Tennis, Tennis, and Track & Field at the 2019 Florida Senior Games. To qualify, one must finish with a Top 5 placing or time in their respective event. Open sports of the Florida Senior Games, presented by Humana, not requiring a qualifying performance include Archery, Bag Toss, Basketball (3-on-3), Billiards, Team Bowling, Dominoes, Lawn Bowls, Powerlifting, Power Walk, Race Walk, Racquetball, Road Race, Tai Chi, and Volleyball. The 2018 Florida Senior Games, presented by Humana, attracted over 2,500 athletes during the nine days of competition. Since the Games inception in 1992, nearly 52,000 senior athletes have competed in the Florida Senior Games, presented by Humana. For a complete listing of the 2019 Florida Senior Games, presented by Humana, Series Qualifiers, click here. The Florida Senior Games, presented by Humana, are presented annually by the Florida Sports Foundation (FSF), the state’s lead sports promotion and development organization, and a division of Enterprise Florida, Inc. The Foundation works in conjunction with a variety of local sports industry partners to present the different competitions. The Florida Senior Games, presented by Humana, an annual amateur sports tradition in Florida, is part of the state’s $57.4 billion sports industry that accounts for 580,000 jobs statewide. © 2019 Florida Sports Foundation. All Rights Reserved.